Discussion in 'Acquistion Targets' started by zuolun, Apr 29, 2013. The 10 year bond yield pushed higher again today. It is currently trading at 2.15%. So why does this matter to the stock market? Why has the stock market all of a sudden gone from a straight up move to a choppy pullback? The reasons are extremely simple and I will lay them out below. 1. When rates rise, borrowing money becomes more expensive. As interest rates rise, housing will take a hit. The Federal Reserve has made it clear they believe housing is the key to an economic recovery. If interest rates jump, less Americans will be able to afford to borrow money to buy a house. The housing market will slow and the economy will follow. The stock market senses this. 2. The 10 year yield is now at 2.15. Yesterday, it crossed the dividend yield of the S&P 500. This means it is now more profitable to buy bonds than to invest in the stock market. Considering that the stock market is extremely high and possibly due for a correction, many investors are opting for the safety of bonds which are still going to pay out more than stocks on a yield basis. In simple terms, two investments, one pays you 2.15% with little risk while the other pays you 2.00% with a lot of risk, which one do you choose? The answer is obvious and a major reason why the stock market has started to get jittery. These are the keys to understanding why interest rates/yields matter. The Federal Reserve wants to keep rates low so housing recovers, the economy does better, and money flows into stocks. The Federal Reserve keeps rates low by printing money in the form of quantitative easing. However, they cannot print forever. The market senses this and is beginning to react. NEW YORK (Reuters) - Worries the Federal Reserve may begin to slow its stimulus efforts sent U.S. mortgage rates last week to their highest level in a year, drying up demand for home refinancings, data from an industry group showed on Wednesday. The Mortgage Bankers Association said interest rates on fixed 30-year mortgage rates surged 12 basis points to average 3.90 percent in the week ended May 24. It was the highest level since May of last year and the biggest jump in 14 months. The rise sent the seasonally adjusted index of mortgage application activity down 8.8 percent as refinancing applications tumbled 12.3 percent. It was the biggest drop in refinance applications this year as demand fell to the lowest level since December. The refinance share of total mortgage activity decreased to 71 percent of applications from 74 percent the week before. Still, the gauge of loan requests for home purchases, a leading indicator of home sales, rose 2.6 percent, suggesting potential homeowners may have sought to lock in a still-low rate. Fed chairman Ben Bernanke said last week the Fed could scale back the pace of its bond purchases at one of the "next few meetings" if the economic recovery looked set to maintain forward momentum. The comments sowed concerns among investors that the Fed's ultra-loose policy could end sooner than expected. Encouraging economic data last week also contributed to that view as home sales rose and durable goods orders improved. "Rates rose in response to stronger economic data and an increasing chance that the Fed may soon begin to taper their asset purchases," Mike Fratantoni, MBA's vice president of research and economics, said in a statement. The Fed is currently buying $85 billion a month in bonds and mortgage-backed securities as it seeks to keep borrowing rates low. The low rates have helped the housing market, luring in buyers off the sidelines. The recovery in housing has been gaining traction since last year and data on Tuesday showed home prices saw their biggest annual increase in nearly seven years in March. Rates had already been on the rise before Bernanke's comments and have gained 31 basis points since the start of the month. Global markets face a witches’ brew of new risks as Japan’s monetary adventure wobbles, China slows further and the US Fed prepares to shut the spigot of dollar liquidity. Yields on 10-year Japanese bonds (JGBs) have doubled in a month and spiked dramatically to 1pc on Thursday, triggering a 7.3pc crash in the Nikkei stock index. It was the biggest one-day fall since the tsunami two years ago, comparable with wild moves seen at the height of the Asian crisis in 1998. The contagion effect set off a retreat from stocks across the world, though Wall Street later pared losses. The iTraxx Crossover or “fear gauge” for corporate bonds jumped 25 points to 392. The Bank of Japan (BoJ) intervened with $20bn (£13bn) to drive down yields again but the failure to ensure an orderly debt market has started to rattle investors. 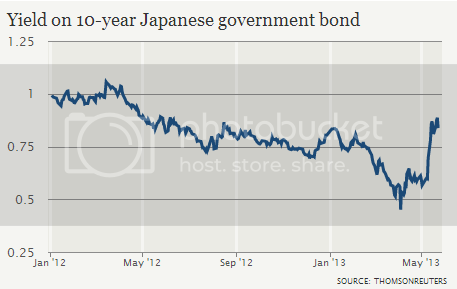 Banks, pension funds and insurers appear to be dumping JGBs for fear of being caught on the wrong side of a bond rout. Richard Koo from Nomura, an expert on Japan’s Lost Decade, said the sell-off in recent days has shown that the BoJ may not be able to hold down yields “no matter how many bonds it buys”. This could lead to a “loss of faith in the Japanese government” and the “beginning of the end” for its economy, if handled badly. The drama in Tokyo came amid fresh signs that China is struggling to manage the hangover from its four-year lending boom, which has pushed credit to 200pc of GDP and spawned a shadow banking system. The HSBC manufacturing index tipped below the contraction line to 49.6 in May. “There is simply no recovery,” said Yao Wei from Societe Generale. China’s leaders are walking a fine line, reluctant to overdo stimulus for fear that it will leak into the property bubble and perpetuate a deformed structure. Fitch says the economic return on lending has collapsed over the past four years from a ratio of 0.8 to 0.35, a sign of credit exhaustion. Morgan Stanley has stopped relying on Chinese growth data to assess growth, using proxies such as Korean exports and Taiwan bonds. “China is slowing hard. We are concerned that leverage is higher than reported, and banks have a huge maturity mismatch,” said Hans Redeker, the bank’s currency chief. Global equities have risen 27pc since July, lifted first by the Fed’s “QE3”, then the move by Mario Draghi at the European Central Bank to back-stop Italy and Spain, and, finally, by the reflation blitz of Japan’s premier, Shinzo Abe. Mr Redeker said this phase is over as the Fed shifts gears, with the latest Fed minutes showing that several rate-setters want to wind down bond purchases as soon as June. Chairman Ben Bernanke has given mixed signals, but it is clear that the Fed’s centre of gravity is shifting. “The Fed is moving to neutral. That is why stocks are getting hammered. It is toxic for anybody around the world who relies on dollar funding, and that means emerging markets,” said Mr Redeker. Marc Ostwald of Monument Securities said Ben Bernanke had “signed the death warrant for markets”, while Julia Coronado from BNP Paribas said the Fed’s minutes were “simply astounding”, creating total confusion over when it will taper off QE. “What may be in store over the next few months is a showdown between the markets and the Fed,” she said. The mere promise of “Abenomics” has lifted Japanese equities by 70pc since November, with foreign hedge funds accounting for a third of all net long positions, but the dark side is becoming clear. The BoJ is purchasing enough bonds to cover 70pc of Japan’s budget deficit this year under the new governor, Haruhiko Kuroda. This is $70bn a month, almost as much as the Fed in an economy one third the size. Mr Kuroda has played down the spike in yields, though one of his original aims was to cut borrowing costs. “I don’t think the recent rise in yields is having a big impact on the economy,” he said. Officials cite the rise as proof that investors believe the BoJ will lift Japan out of deflation at long last and achieve the new inflation target of 2pc. Professor Richard Werner from Southampton University, author of Princes of the Yen, said nobody knows whether the bold gambit will succeed. “They have been very good at marketing, and investors just love Abenomics, but there is a widening gap between the euphoria and delivery. Very little has actually happened to credit creation so far, and without that there will not be a recovery,” he said. Surging yields have already caused Toyota to shelve a bond issue. The great fear is that a bond rout will set off a banking crisis since Japanese lenders hold JGBs equal to 80pc of GDP. The International Monetary Fund said a 100 point rise in yields would erode the Tier-1 capital of regional banks by 20pc. “At some point, the JGB market is going to crash. The crucial question is whether they can prevent the banking system from being hurt? It will be tricky, and I am not sure the BoJ has thought this through,” said Prof Werner. Mr Koo said the BoJ has undermined the “market structure” that has kept Japan’s bond market stable for 20 years, and invited an attack by short sellers. He said the bank faces a “time inconsistency problem” since markets react more quickly than the economy. The risk is that inflation fears will lead to bond collapse before the benefits of stimulus have fed through. But Junko Nishikoa from RBS said the fears are overblown. “The bottom line is that Japan’s economy is recovering and the BoJ will succeed in holding down risk premiums,” she said. Japan has taken a huge gamble, but Mr Abe says the status quo is not an option either. With public debt to reach 245pc of GDP this year, the country must restore growth in nominal GDP to head off a debt compound spiral. That Holy Grail is at last in sight. The dollar experienced a tumultuous period on the fundamental front this past week – an unflattering one if we consider its role as the world’s favored safe haven currency. Yet, despite the negative implications through traditional channels, the Dow Jones FXCM Dollar Index (ticker = USDollar) managed to hold its two-month congestion pattern just off a two-and-a-half year high. The benchmark currency seems anchored and unyielding to questionable events that contradict underlying themes. However, the market won’t be able to avoid commitment for much longer – especially with central bank-supported risk taking driving the S&P 500 to record highs. As has been the case for months, the dollar’s primary interests remain ‘risk appetite’ and stimulus expectations. And, those two stories are certainly interwoven. Yet, if these two concentrations are so influential, why did the heady mix from this past week not send EURUSD rallying above 1.3250 and AUDUSD to seek out 1.0600? The Federal Open Market Committee (FOMC) policy decision was an event whose outcome was very much in the eye of the beholder. The policy group noted improvement in the labor force while hedging themselves with a warning of ‘downside risks’ to the economy. The real interest, though, was what level of guidance they would offer for the extra-ordinary quantitative easing program. An efficient market has worked to price in the $85 billion-per-month QE3 purchases likely through the end of the year, so any definitive sign of tapering could prove problematic. Perhaps officials recognized the risk to the capital markets if they moved too early in warning of a shift in their exceptional stimulus scheme, because the statement was nearly as untouched as the policy itself. However, there was one meaningful alternation. The Fed made the express move to suggest it was prepared to “increase or reduce” its QE purchases in the future as warranted. This may seem insignificant; but seen from a central bank’s perspective, it is a critical first step. In a perfect reflection of Game Theory, the central bank has to make measured moves with the express knowledge that the market will react to each step with responses that change the environment. Stimulus from the Fed and its peers have unquestioningly influenced the market by driving benchmark yields (and there all rates of return) to record lows while the assumption of risk has evaporated. This has led to a tangible chase for yield where none is to found. Capital gains are the only way to sustain this move, but gravity remains as new heights are scaled. By telling the market that they are ready to make small changes, there should be relatively little surprise should the next Fed meeting – which fittingly enough will include updated growth, inflation and rate forecasts along with Chairman Bernanke’s press conference – report a test move to decrease the monthly purchases. Of course, even if this were the plan, it may not change the outlook for the risk trends and the dollar unless the masses were privy to it. Therefore, every opportunity to weigh the balance of sentiment amongst the Fed officials is a means for tipping the scales. Looking at the docket ahead, there are a number of officials scheduled to speak (Bernanke, Lacker, Evans, George, PLosser, Stein, Pianalto) and the G7 meeting will no doubt bring international pressure for the Fed’s easy money. If there is any tangible threat that the Fed will throttle back on its stimulus support, the impact on risk trends would no doubt be spectacular. Given the divergence between market pricing (S&P 500 at record highs) and fundamentals (yields at record low as growth slows), there is a tremendous discrepancy. And, the dollar would be well-positioned to take advantage. Not only would the smaller projected increase in the US money supply boost the dollar’s perceived value, but the exodus of capital from risk to safety would light a new fire under the currency. That said, not all dollar pairs would benefit such a move. Particularly USDJPY would find the dollar mimicking a carry/investment currency as the unwind in other yen-based crosses would overwhelm any positive influence here. In terms of scale, disrupting the moral hazard that has allowed the incredible divergence between positioning and risk-reward balance is the greatest threat. The power of speculation is strong, so it isn’t difficult to feed fear that this will eventually happen, but that isn’t something we can mark on a calendar. In the meantime, dollar traders will have little event risk to work with this coming week and should instead keep an eye on the headlines and any sign that investors are simply trying to take profit in traditional assets. From a crisis comes opportunity: African countries are turning to the global bond markets for funding, with Rwanda the latest to make its debut. That marks a shift in investor perceptions of where risk lies in government-bond markets. Many African countries have features that appeal, such as high growth, low debt and good demographics. Moreover, many have been introducing reforms at a pace of knots. But investment has yet to come to Africa in a big way. Rwanda's deal follows recent public and private debt issues from Zambia, Kenya, Angola and Tanzania, and raised $400 million for 10 years at a yield of 6.875%—or a premium of more than five percentage points over U.S. Treasurys. The final yield was lower than the expected level in the low 7% area, with order books close to eight times the amount on offer. That is perhaps unsurprising given the search for growth under way among investors. Rwanda grew 7.7% in 2012, and is forecast to grow 6.8% in 2013 by Renaissance Capital. Africa might be the only region to grow faster in the next 10 years than in the prior decade, UBS reckons. Sub-Saharan Africa may be a particular beneficiary: The IMF forecasts growth of 5.6% in 2013, accelerating to 6.1% in 2014, with low-income countries growing the fastest of all. Some might fear that this marks the start of renewed unsustainable debt accumulation in Africa. But Rwanda's deal speaks against that. Only $200 million is new borrowing, with the rest refinancing debt. The country could clearly have raised more; indeed it is probably paying a premium to borrow less as the bond doesn't meet the $500 million cutoff to join benchmark J.P. Morgan emerging-market debt indexes, and thus represents a so-called off-index bet for investors. And to benefit from debt relief from richer countries, Africa's governments have had to undertake market- and investor-friendly reforms. Rwanda, for instance, now ranks 52nd in the world for ease of doing business, above the Czech Republic, Turkey and Italy, according to the World Bank. Yet Africa still represents an untapped opportunity for many investors. Take the $725 billion Norwegian government pension fund, which last year massively increased exposure to emerging markets as it sought exposure to growth. Of its more than 4,000 bond positions, just 23 were in Africa. Ratings will no doubt constrain some investors; Rwanda is rated in the single-B category, well below investment-grade. But ratings, unlike those in the developed world, seem likely to rise over time. A big problem historically has been gaining access to Africa other than through foreign direct investment. A flowering of African bond issues could be an attractive opportunity that also offers diversification and the holy grail for today's investors: yield. The World Interest Rate Table covers the current interest rates of 23 different countries including previous rates and the latest dates when they were changed by Central Banks. The benchmark interest rate in Brazil was last recorded at 7.50 percent. Interest Rate in Brazil is reported by the Banco Central do Brasil. Historically, from 1999 until 2013, Brazil Interest Rate averaged 16.23 Percent reaching an all time high of 45 Percent in March of 1999 and a record low of 7.25 Percent in October of 2012. In Brazil, interest rate decisions are taken by The Central Bank of Brazil's Monetary Policy Committee (COPOM). The official interest rate is the Special System of Clearance and Custody rate (SELIC) which is the overnight lending rate. This page includes a chart with historical data for Brazil Interest Rate. The Committee decided to raise the Selic rate to 7.50%, without bias, by six votes in favor and two votes for the maintenance of the Selic rate at 7.25%. The committee judged that the high level of inflation and the dispersion of price increases, among other factors, contributed to resilience in inflation and required a monetary policy response. On the other hand, the Committee considers that internal and, mainly, external uncertainties surround the prospective scenario for inflation and recommends that monetary policy should be administered with caution.